LOUISVILLE, Ky. – Louisville City FC Head Coach John Hackworth and Phoenix Rising FC Interim Head Coach Rick Schantz have been tasked with similarly difficult assignments this week as they prepare their respective sides for the 2018 USL Cup on Thursday night (8 p.m. ET | Match Center | ESPN2) at Lynn Stadium in Louisville. That assignment, which has proven to be problematic for six other USL Head Coaches so far this postseason, is to figure out a way to defeat the other in the most important game of the year. Throughout the playoffs, Louisville and Phoenix have demonstrated their abilities to light up the scoreboard but also play lock-down defense when the situation calls for it, outscoring their opponents 11-2 and 9-3 respectively over three postseason games. That well-rounded play has led each club to three straight wins, a conference championship and earned plaudits from some of their competition. Louisville’s chemistry on the field – helped by retaining core players like Kyle Smith, Paco Craig, Niall McCabe and Cameron Lancaster – has led to its consistent success since joining the league, as the reigning USL Cup champion has finished in the top-two of the Eastern Conference standings and reached the conference final in all four of its USL seasons. One the other hand, Phoenix entered this postseason without a playoff victory in its history but has finally broken through to earn its first piece of silverware and begin meeting the club’s lofty expectations. While Rising FC hadn’t experienced this level of success previously, there was little surprise in Phoenix and elsewhere that the West’s No. 3-seed emerged from the conference as one of the USL’s elite clubs. Specifically, coaches noted the pace of wingers Solomon Asante – who was named to the 2018 USL First Team earlier this week – and Jason Johnson as a constant threat in Phoenix’s counterattacking style of play. Rising FC has been happy to sit back and absorb pressure during the team’s three postseason matches – averaging just over 35 percent possession over that stretch – and then use their speed on the flanks to break quickly when given the chance. As another Western Conference Head Coach pointed out, Phoenix has made the most of those counterattacking opportunities this postseason by sharpening its finishing. Rising FC has more than doubled its regular-season shot conversion rate of 14.69 to 31.03 in this year’s playoffs and while that’s obviously been over a smaller sample size, there’s been little doubting the quality of Ivory Coast legend Didier Drogba in front of goal. The 40-year-old, who will hang up his boots after the USL Cup, has continued to roll back the years for Phoenix by finding the back of the net in all three postseason wins. 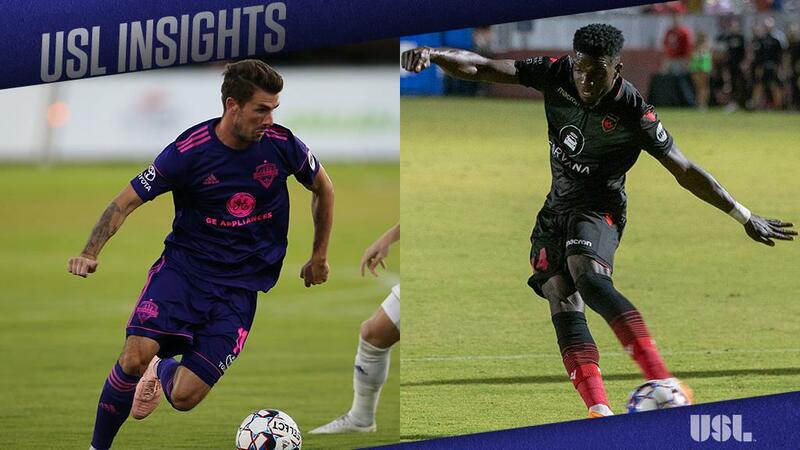 Just as Drogba is happy to dip into midfield to retrieve the ball and bring Phoenix forward, Louisville’s center backs Paco Craig and Alexis Souahy are more than willing to build their side’s attack from the back. An Eastern Conference Head Coach believes that LouCity wants to pass its way out of defense but also are practical in their approach and will play the ball long if other options aren’t available. He also praised Louisville’s ability to keep the ball in the opponent’s half – the side has completed 645 passes over the midfield stripe this postseason, 159 more than Phoenix – and apply pressure on their opponents. In a match that looks likely to pit two contrasting styles against each other, Phoenix may have an opportunity to continue finding success on the counterattack by getting the ball into Drogba in a No. 10 role to then release their wingers in behind the Louisville defense. While Phoenix will try to exploit some of those spaces on one end, Louisville will be tasked with drawing the visitors out of their defensive shell on the other. One way to do that could be forcing Rising FC to honor shots from distance by testing goalkeeper Carl Woszczynski early in the contest, rather than settling for hopeful crosses into the penalty area. After the opening whistle sounds on Thursday night, the chess match within the match could go a few separate ways, but there’s one thing that coaches, fans and everyone can agree on heading into the USL Cup.